Sometimes spots are found by talking to friends, while looking for them on the web or by wandering around the city. De TOKO came to my attention due to the parking problem in my neighbourhood. On a Friday evening busy looking for a parking space I came across a place not knowing whether it was a bar, cafe or restaurant with just a few tables and loads of people inside. As soon as I parked the car and got home, I wrote down the name and went there the next day, together with a bunch of friends. 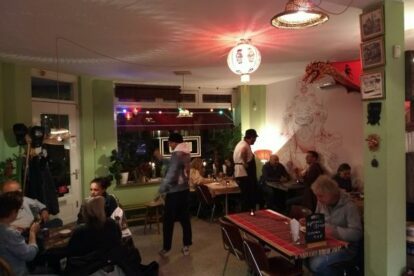 Quickly we found out that De TOKO is not a bar, not a cafe but a small cosy restaurant and take away. Even though De TOKO looks more like a small store where you can get a ‘Prima Tassie’ full of delicious take away food, you can also grab a seat and eat inside. The place is run by the young Paul Toorop but don’t be surprised if you also come across the rest of the family Toorop. They all contribute in making this spot a great one to visit. My knowledge about Indonesian food isn’t that good but thanks to De TOKO it’s getting a lot better. If you don’t know what to choose, just ask them to prepare a plate of everything they have for you. It’s a mix of fish, meat, rice and other delicious flavours. It can get spicy though, but you should definitely try them all!